Kodak Brownie 44A, 127 roll film camera, c1960. Photograph gallery. 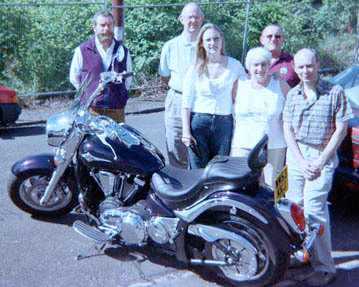 Amongst all the family pictures taken over the decades are several depicting people standing proudly besides various motorcycles, it seemed appropriate therefore to finish the old roll of 127 found in the camera in the same way. The bike in this case being a very proud looking VN2000. Taken using the smallest stop available the result is more or less as expected from the camera. I was more amazed the film still worked. 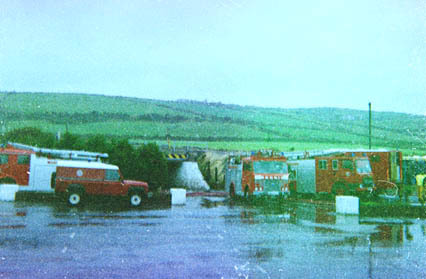 Perhaps more surprisingly is the fact that frames exposed 20 years previously also yielded results, I have no idea what is happening here or the date, but there seem to be a lot of fire engines in attendance. It's interesting to see that both these images were exposed on the same film, but 20 years apart, the older exposure deteriorated in the camera, whilst the unexposed portion of film retained a newly exposed image that much better.